I’ve been freelancing since 2012. I love all the obviously great things about freelancing: the ability to collaborate with a broad range of clients on many different topics; the freedom to set my own hours; and the flexibility of being able to work from just about anywhere. 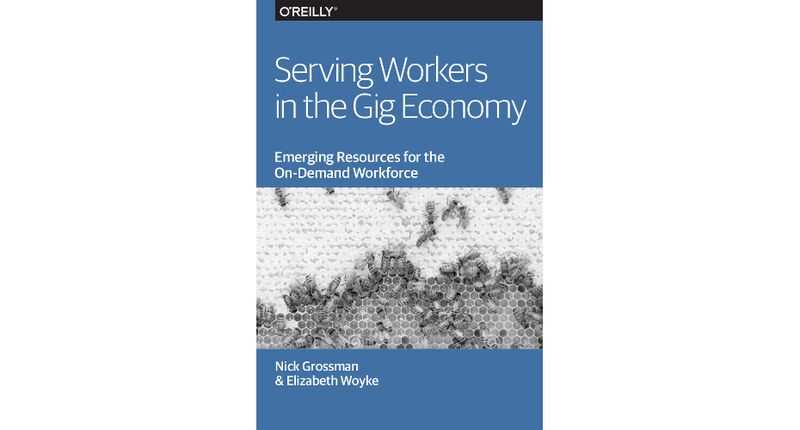 The e-book, which you can download for free here, traces the emergence of the gig economy and the “unbundling” of traditional worker protections — such as insurance and retirement planning — from employers, who typically don’t provide such services in the gig economy. The e-book also examines the ways in which independent workers are obtaining these protections on their own. A number of startups are popping up to give/sell independent workers a “social safety net” or at least parts of one. While working on the e-book, I interviewed 12 of these startups. Through the conversations, I learned about the hurdles people face — and overcome — to work in the gig economy. For example, Uber drivers not only need to have cars to ferry passengers in, they also must have car insurance in their own names. For years, that rule was a significant barrier to entry for people who lacked cars and the credit history and/or credit rating needed to buy or lease a car. But a startup called Breeze has given these people an entrée to the gig economy by leasing them cars (at affordable rates) and matching them with ridesharing jobs. I also interviewed the leaders of the Freelancers Union and Coworker.org and found their words inspiring. Both are fighting to amplify gig workers’ voices and relay their concerns to policymakers. These initiatives are important. Freelancers are vulnerable in many ways — to late payments, nonpayment, arcane tax rules and byzantine insurance policies, among other issues. The gig economy needs to work for independent workers and not just the other way around.